Mouser Electronics, Inc., the authorized global distributor with the newest semiconductors and electronic components, is now stocking the ACEPACK IGBT modules from STMicroelectronics (ST). Part of a new plastic power module family developed mainly to address industrial applications, the Adaptable Compact Easier PACKage (ACEPACK) modules provide economical and highly integrated power conversion for 3 kW – 30 kW industrial and power management solutions. These robust modules combine high power density with reliability, delivering one of the best combinations of conduction and switching performance available. 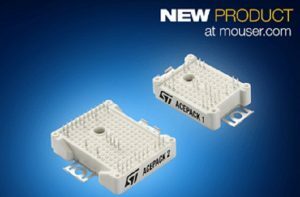 The ST ACEPACK IGBT modules, available from Mouser Electronics, come in two compact configurations and feature ST’s third-generation trench gate field-stop IGBTs. Designers have a choice of six-pack modules that contain six IGBTs with freewheeling diodes as a three-phase inverter, or Power Integrated Modules (PIM) that provide a complete driver power stage. The PIMs are converter-inverter-brake (CIB) modules that integrate a three-phase rectifier, a three-phase inverter, and a braking chopper for handling energy returned from the load. Both module types also contain an NTC thermistor for temperature sensing and control. Available in either ACEPACK 1 or larger ACEPACK 2 sizes, featuring either 650V or 1200V IGBTs, and current ratings from 15 A to 75 A, these optimized IGBT modules deliver low stray inductance and low electromagnetic interference (EMI) emissions to simplify meeting electromagnetic compatibility (EMC) regulations. Operating temperature rating up to 175 degree Celsius ensures robust performance under the harshest of operating conditions, giving designers freedom to optimize heatsink size and power dissipation. The baseplate of the package is also isolated to 2.5kV to ease design of assembly. ST’s ACEPACK IGBT modules are available in a variety of mounting configurations, including optional solder-free press-fit connections, which simplify assembly as an alternative to conventional soldered pins, and metal screw clamps that enable fast and reliable mounting. The ACEPACK modules provide an ideal solution for applications such as industrial motor drives, air conditioners, inverters, solar panels and generators, welders, battery chargers, uninterruptable power supplies (UPS), and electric vehicles.